Have a good look through the menu above – especially the “Welcome” “Training” & “Diary” menus. Like what you see ? Then just come along on a Tuesday or Thursday -we don’t bite! It was a weekend so packed that the update comes in two parts! 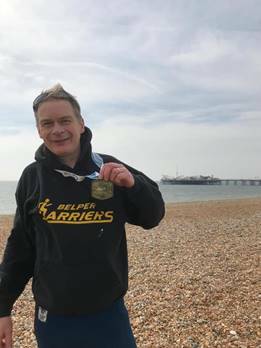 Aside from the other events mentioned by Cat previously, Harriers were involved in three different marathons on Sunday 14th April. First up, the Paris Marathon, which sees 50,000 runners take to the streets of the glorious French capital. it’s a flat, fast and very scenic course which boasts glimpses of world famous landmarks such as the Eiffel Tower, Notre Dame cathedral (sob…) and the Place de la Concorde. It truly is a superb event. 5 Harriers took part. Josie Lockwood ( 3.33.42 – a PB!! ) , Dan Clark (4.08.00), Rachel Clark (4.07.59) – Rachel you beat your husband by 1 second well done!! ,Annie Sloane (5.27.17), , Tara Buckley (5.46.23). Well done all. The Boston Marathon (UK) boasts the “flattest marathon course in the country” – but don’t they all say that?! Starting in the lovely port town of Boston, Lincolnshire (most famous for the ‘Boston Stump’) the route heads North East towards Wrangle, and loops back for a glorious finish back in Boston. Cabbages or no cabbages, Helen Morley managed a superb 3.27.12, with Helena Houghton achieving a PB with 3.53.34. David Horton got a magnificent time of 3.25.33. Nathan Fowles finished in 4.12.21, well done! Twenty-three thousand runners all milling around aimlessly (or in the loo-queue) and who do I see coming towards me, but the Harriers’ own Nathan Fowles. After a short chat, I head off to find my wife, Justine, who’s joined the coffee queue for me. After downing the legal drug, I make a beeline for the start pen, where who do I find, but Nathan, looking his usual quiet, confident self. He’d spent the night before in a lovely Airbnb on the nearby seafront, whereas all we’d been able to find was pretty dire room in flat on an estate in the outer reaches of Hove adorned with a plethora of “thou shalt not…” messages. Not great prep, although we’d managed a meal in a rather excellent and authentic Italian run by a patriarch who looked just like the Mafia boss from the Italian Job. The start is a steady uphill, and I soon lose sight of Nathan, and I struggle to catch the 3.30 pacer with his pink balloons attached to his waist. Once I join the gaggle of runners around the pacer, I zone out and settle into a comfortable 4.50/km pace. Without realising it, I slowly pull away from the pacer, and find myself running with two locals who know the route well – “keep on the right side here, because the camber’s a bit pronounced on the left”. This sounds insignificant, but when you’re running as unprepared as I am, every subtle advantage helps the ankles. I stay with these two for most of the race, and even make an effort to catch them after I stop for a wee. The support through the centre of town is tremendous, and even on the far ends of the course there’s a great deal of enthusiasm from the side of the road. A stiff easterly breeze (probably the same one that the ladies in Boston had to contend with), isn’t a great problem at this stage, as the field is still bulky enough to provide some shelter, and I let others take the brunt of it. Nevertheless, the turn at the far eastern end of the route comes as a relief, and I enjoy the feel of the wind between my shoulder blades, and smile as I pass 2 rhinos and a large pair of testicles heading out to the turn. The half-way point is right in the centre of town, and I think that it seems a long time coming, although my 1.41 split is pretty well what I hope for. The next third is pretty uneventful, with continued noisy support from locals and many and varied bands (rock, brass, drum, rap) spurring me on. I’d been provided with a running vest from work with my name on it (they paid for my entry – thank you Philips Healthcare), and the continuous “Come on David” shouts are a real help to me. For a long time I think that I must be running alongside a popular local runner called David, but a quick chat with those around me established that I was the only David. By the far west turn, I’ve still not caught Nathan, and as we approach the loop around the power station I’ve not seen him pass the other way, so I reason that he in on the loop, and therefore perhaps 2 or three minutes ahead. The wind is ferocious after the turn, and as the field had spread out there is little shelter to be had. I feel good, and able to push the pace into the headwind, but this means I’m unable to take any advantage from shelter. Many runners are obviously struggling at this point, and there are several reduced to walking or stretching their calves against the sea wall. At the start of the race my calves were still taut after the recent Derby 10k and BDL, and I’ve so far been careful not to push it too much, as the last thing I need was to have to pull-up with cramp in the final 4 miles. I start to very gradually increase my pace, and once back to where the crowds were the most vocal along the promenade, I decide I can afford to give it what I have left, managing a 4.30/km pace for the last mile. The overhead time-clock is counting down the gun-time towards 3:30 as I approach, and it spurs me on to try and beat the clock to the line. I just manage it, and I finish with a 3:25 chip time. I’m quite happy with that, but most happy that for the first time ever, I’d stuck to my race plan. I expect to see Nathan at the finish, and it was only later that I realise that I must have passed him somewhere around 25k. He had a tough 2nd half, and I’d been too zoned out to notice his Harriers vest. The route was varied, the atmosphere was tremendous, the staff cheery and helpful, and the finish on the sea-front was lovely. I intend to be back there next year, but this time, I’ll book some nice accommodation in plenty of time. In the meantime, I’ve got the White Peak Marathon to look forward to next month, when I have a score to settle with a Mr Marsden. Sunday 14th April was an extremely busy day in the race calendar! So many harriers representing the club in the UK and over the channel in Paris. For those that didn’t fancy one of the many marathons on offer, there were lots of other brilliant races to choose from. The most local was the Peats Pits Woods race, hosted by David Denton. A short but suitably challenging off road race. This was well attended by the club, and several harriers achieved stand out results. Ruth Keeley ran a super speedy race and was first lady back. Ed James claimed 3rd place overall. Andy Paisley, and Mark Beighton also placed in the top ten with some equally impressive times. A little further from home, Laura Jane Cummings represented the club at the Sheffield half Marathon. A hilly course but with great views of the peak district, the friendliest atmosphere she’d ever encountered at a race, and great support. Emily Cartwright also completed a half marathon, at Rutland Water. Clare Cooper and Debs Spendlove completed the Lakeland trails 16K Hawkshead Trail Race. An off road route taking in panoramic views of Lake Windermere and the surrounding peaks of the Coniston Hills, the Langdales and most of the Lakeland fell. Although the route was challenging and included the mile long, near vertical, killer climb of the ‘Coffin Trail’ they both highly recommend it! A superb weekend of running and that’s not even all of it…! Race season is in full flow! And the Summer BDL league is back (more on that in a moment). The Derby 10k is always a hugely popular event, and this year was the biggest yet, with over 4800 runners registered. At least 20 Harriers were there, and some fantastic results were recorded. Shaun Bott finished in a superb 25th overallplace with a 10k PB of 35.46. Andrew Marsden and David Horton also recorded sub 40 minute finishes. Louise Rowley was fastest female Harrier and 21st female overall with a PB of 42.14. The Greater Manchester Marathon saw 5 Harriers cross the finish line to glory. Lily Brickman and Nathan Brickman both finished in 3.52.46 (what are the chances?) Helen James with 4.14.27 and Kelly Wigley with 4.38.16 (A PB I believe, Kelly). Kudos to Ant Beardmore who was using Beer to celebrate his PB of 3:14:20 too! Well done all. This weekend saw some really tough races, and of course some gritty Harriers performances! Let’s face it, a fell race in the Hope Valley with 1500ft of climbing would be tough enough in perfect conditions….but with hail, mud, rain and high winds….even tougher. Nevertheless, 11 hardy Harriers took on the challenge. The Wolfs Pit fell race was the first of ten events in the ‘Gritstone’ 2019 series. Joel Paisley finished 12th place overall, in 46.16, with Ed James cracking the top 30 with 49.03. First Belper lady (and 6th lady overall..!) was Ruth Keeley in 57.15. 6 Harriers took to the roads in Nottinghamshire for the Notts 20. Some were marathon training, some just fancied the challenge, and 20 miles is indeed a challenge. Helen Morley (2.32), Helena Houghton (2.50) and Rachel Clark (2.58) managed a superb sub-3 hour run, and Keith Chandler (3.27) Kelly Wigley (3.38) and Tara Buckley (4.07) also recorded good times. Finally an Ultra Marathon which makes my legs ache just thinking about it – the Hardmoors 50. A 50+mile trail ultra in the North York Moors, again – in good conditions this would be a serious challenge, and on Sunday, good conditions it certainly wasn’t. Add in the 6500ft ascent, and it becomes a real tough feat. 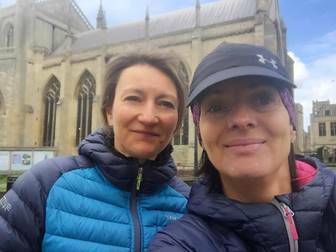 Wendy Amis completed the course, and Clare Cooper completed a hugely respectable 31 miles, before the bad weather scuppered things. Well done both. SAVE THE DATE BOOK YOUR PLACE TODAY! Thanks Alan Billington for adding a link on the Harriers webpage under the shop menu called ‘Grinton Lodge Harriers Weekend’ – you can make 1 full or 2 part payments (which add up to £80) by clicking this pay pal button and entering the value of what you would like to pay as the quantity e.g 80 for £80 – then please post a comment on here to say paid thank you. This is a stunning location with beautiful trails to explore so what are you waiting for secure your place asap. The weather forecast was optimistic. Dry, sunny intervals and a bit of wind. Perhaps the optimism was a bit premature, as the weather & conditions underfoot were a little bit ‘challenging,’ with 40mph hail, rain & lots of mud… Raincoats and grippy shoes were essential! One harrier was obviously delighted with the conditions and said ‘why waste money of expensive spa treatments when you can have your own hail & mud facial for a fraction of the price?’ Another commented on the excellent quality of the mud facial they got at Chatsworth, but were disappointed it (surprisingly) didn’t smell of sandalwood…. Despite the challenges of ‘mother nature’ allowing us to experience the weather of all 4 seasons in one day, we all completed the course in very respectable times! Ed James ran a fantastic race and claimed 8th place overall out of 467 runners! The on course support was superb, as were the fuel stations laden with cake and other delicious goodies. The post-race buffet of soup and (you guessed it) more cake were also much appreciated! A fantastic & enjoyable day of running was had by all. 15 harriers entered and all completed the course. What a fantastic turnout! If you haven’t run the Gallop before, get it in the diary for next year! It’s a fantastic day out, and certainly an experience you won’t forget! Now the dreaded Winter period is coming to an end, the events are starting to come thick and fast. And speaking of fast, lets start with some fantastic performances at the Cross Country Nationals, at Harewood House, Leeds. This took place on Saturday 23rd February, and saw Karolina Kucharek and Joel Paisley the fastest female and male Harriers respectively. Hats off to all that made the trip, some great results. More recently, the David Denton Bluebell Fell Race, on Sunday 3rd March. A local, scenic ‘undulating’ 6.2k race in decent conditions saw a fantastic 7th place finish for Mark Beighton. Ruth Keeley was the fastest female Harrier, coming in 16th overall place. Get all posts emailed to you!